Fortunately for newcomers, getting around Anna Maria Island is a breeze – literally. Many of the island’s main roads run parallel to the ocean or bay, allowing you to easily locate yourself without turning on the GPS or opening Google Maps. 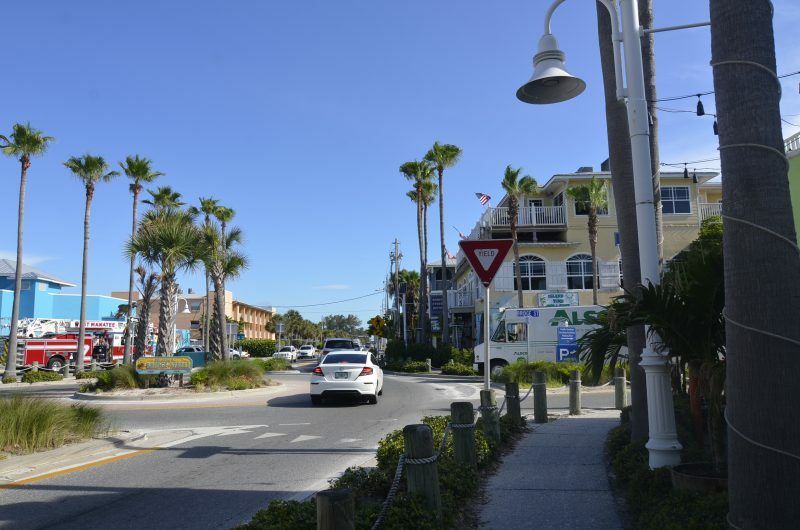 Below are a few of the most important main streets to know on Anna Maria Island. Gulf Drive runs from the southern tip of the island through the city of Holmes Beach and along Manatee Beach, continuing north through the middle of the island, and eventually winding its way to the gulf side of the island. Gulf Drive is a happening place, with great Anna Maria Island shopping, restaurants, accommodations, and more along it. Though a main thoroughfare, it’s largely a quiet residential street with beautiful foliage and ocean views. Gulf Drive is the most westerly north-south street on the island, ending at the north end close to where it intersects with Pine Avenue. Gulf Drive North and South on the southern end of the island, connects the cities of Anna Maria, Holmes Beach and Bradenton Beach, and, eventually, AMI to Longboat Key. In southern Bradenton Beach, the street is home to a number of restaurants, including Gulf Drive Café, a Mexican cantina, and a beachside café. Historic Pine Avenue is a bustling street of eateries and attractions – the perfect walkable place to grab a bite to eat, go shopping, and absorb some of the island’s local history. Pine Avenue is full of cafes and restaurants, including a tasty Mexican taqueria, a pizzeria, an ice cream parlor, and a dress-your-own donut shop. Here, you’ll find a couple of different surf shops for all your beach gear, souvenirs, and paddlecraft rentals. Some of the best Anna Maria Island shopping can be found here. Pine Avenue is also the heart of the island’s history. The Anna Maria Island Historical Society and the Roser Community Church are both located on Pine, and Bean Point, the island’s first settlement and homestead, is just a few blocks away. The road runs from gulf to bay sides of the island, ending at Anna Maria City Pier on the east end. Bayfront Park is just north of the City Pier. Conveniently, the free local trolley stops at the City Pier, so it’s very easy to get to Pine Avenue for shopping, eating and outdoor fun no matter where your vacation rental is located. Turn north at the eastern end of Pine Avenue, and you’ll be on Bay Boulevard. Head just a few blocks north to Bayfront Park, a popular family spot for swimming, picnicking, and playing outside. This spot is known for its incredible views of Egmont Key, the Sunshine Skyway Bridge and Tampa Bay. Continue north on North Bay Boulevard to historic Bean Point for more amazing ocean views, more wildlife and the perfect sunset. Or, head south on Bay Boulevard to a point overlooking Bimini Bay that’s home to a few sailing companies and the Island Ocean Star restaurant. While Manatee Avenue isn’t the best road for an afternoon stroll, it is an important one to know, as it’s the main access point onto the island from mainland Bradenton. The road includes large sections of bridge, crossing Palma Sola Bay, passing by the Robinson Preserve to the north and the Neal Preserve to the south – both worthwhile visits for the nature-loving vacationer. The stretch of Manatee Avenue closest to Anna Maria Island looks out over the open Gulf waters, crossing Anna Maria Sound, with the Sunshine Skyway Bridge in the far distance north. A couple blocks after passing the “Welcome to Anna Maria Island” sign, Manatee Avenue turns into Gulf Drive. Anna Maria is a small, quaint island with a few main streets that you’ll soon get to know well. Getting around Anna Maria Island by car, bike, or foot is easy – after a day or two on vacation, the island will start to feel like a home away from home. For more information on things to do, transportation, and vacation rentals on Anna Maria Island, give us a call today. Our team can help answer all your pre-departure questions – by the time you’ll get to AMI, you’ll already to know the island like the back of your hand.